If you want to feel like a Princess when you arrive at a hotel, the grand entrance to the Renaissance will certainly tick any unfulfilled childhood Disney fantasies. 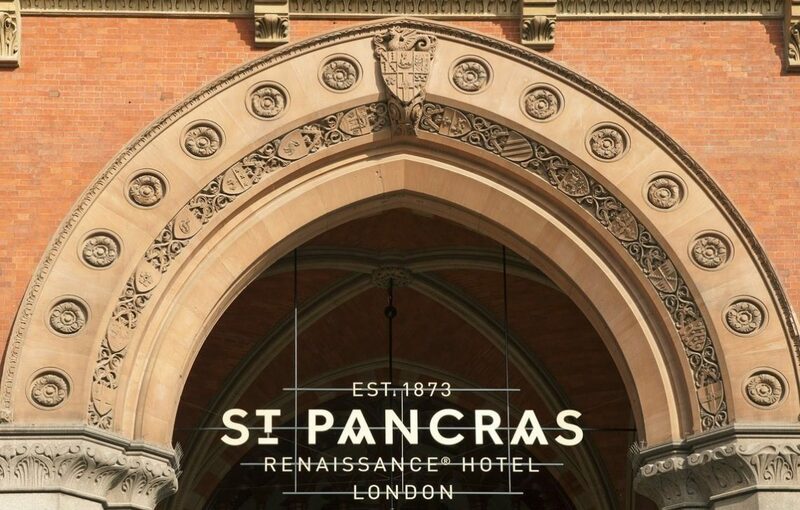 A mere sashay, away from Kings Cross Station (parts of the hotel are even above it), the location of this historical building could not be more central. A grand cobbled driveway leads you away from the city’s hustle and bustle, and if you can ignore the gridlocked Euston Road, you could almost be doing a George and Amal Clooney on their visits to romantic Lake Como. 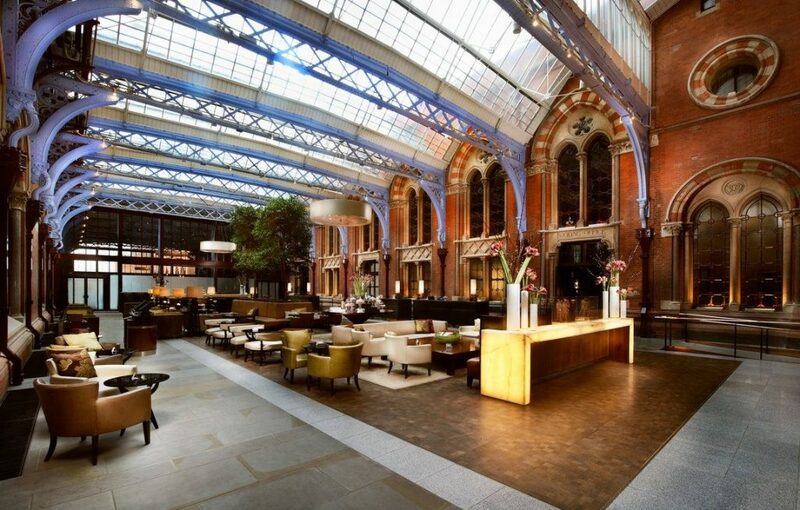 As a contrast to the impressive period exterior, the lobby is modern luxe. Filled with light from the incredibly high ceilings and skylights, this grand-dame is reassuringly elegant with a hint of eccentricity. Yet when you take a closer look, the Victorian history is preserved with up to date twists on the original features; From the Chambers Club to the long, silent corridors, the Neo-Gothic hints are less subtle, more sledgehammer; If you’ve ever wanted to know what it must feel like to be in a period drama I imagine this is a pretty good place to start. It has also been the setting for 1o2 Dalmatians, Batman and Richard III. And the infamous platform 9 and ¾ brought to life by Harry Potter is accessible through the Booking Room. 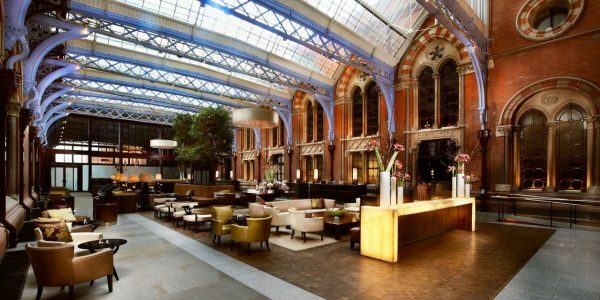 The original hotel was designed by architect George Gilbert Scott in 1873, and although it has been carefully re-modelled to take on 21st century incarnation, the sheer vastness and history means that it is one of London’s original gems. 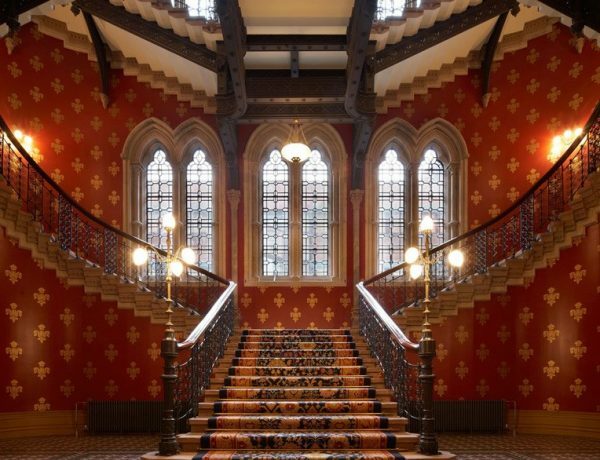 One of the most dramatic features is the Grand Staircase. Imposing as it is impressive, the stairs loop and swoop, and exude romance, drama, and a sense of losing a glass slipper! 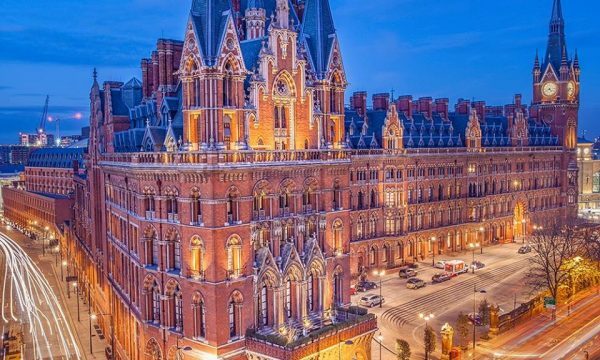 The fact that this also featured in the Spice Girls movie, is enough of a draw for tourists to stop by for afternoon tea. Millennials get more pleasure in knowing it’s where Taylor Swift and Zayn Malik filmed the video for “Don’t wanna live together” for the soundtrack to 2017’s ’50 Shades Darker’. 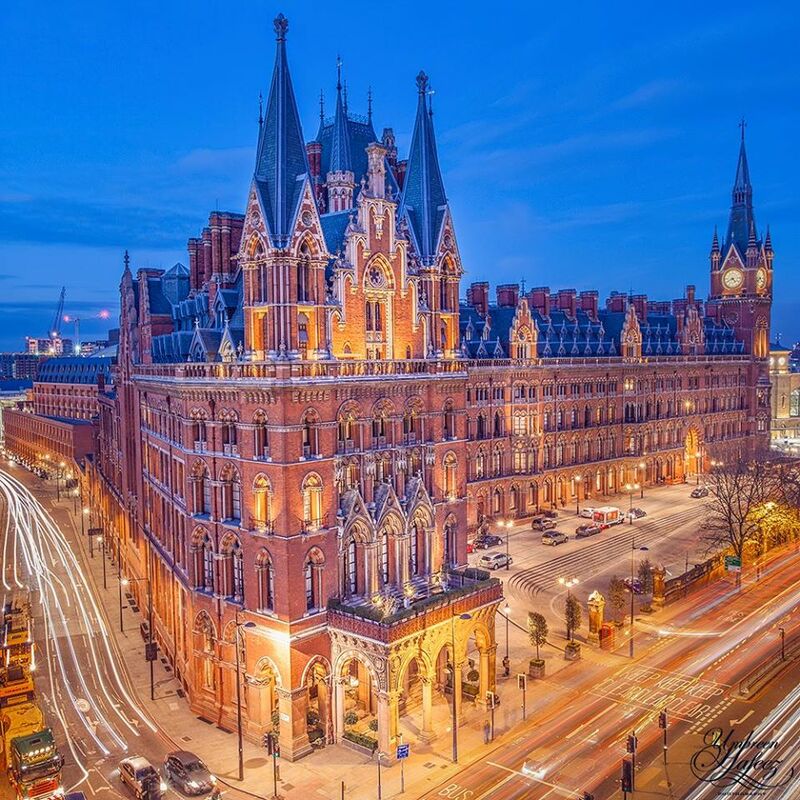 Perfectly situated for international travellers, the Hotel stands on the same ground as St Pancras International Station making it a great base to get around London. 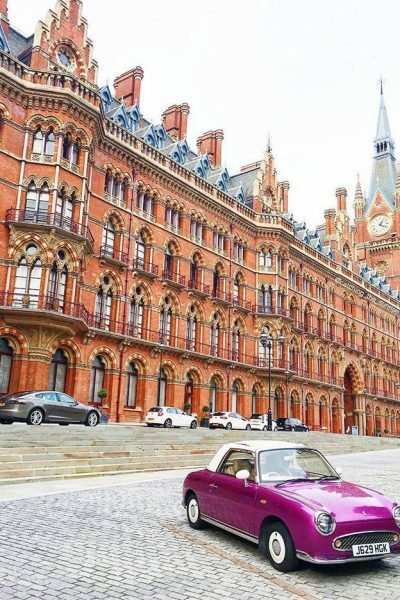 Not central enough to be in ‘touristville’, the surrounding area has recently been regenerated, and Kings Cross is not longer dodgy after dark; With art galleries, synchronised fountains, al fresco restaurants and trendy bars, this is a just off centre hotspot for the locals in the know. However, the throbbing heart of the beating heart of London, is only hop skip and jump away, and alas I wasn’t there to soak up the scenery. I was on serious fashion business, and it was the ideal base for me to use for the London Fashion Week shows which were taking place at 180 The Strand. 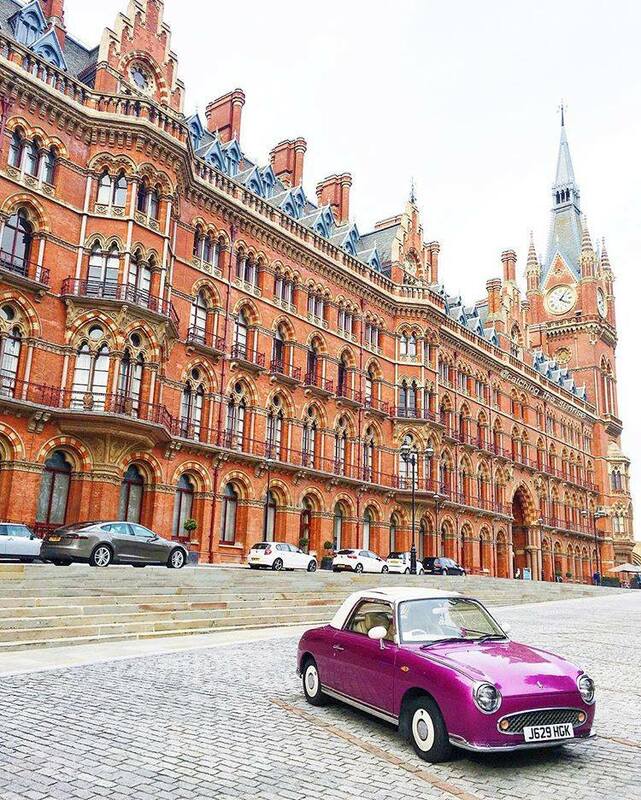 With jam-packed days leading into impromptu soirees, it meant even longer nights, so pulling up in a cab in front of the elegant Neo-Gothic façade was the icing on my fashionable cupcake! Inside my junior chambers suite, I didn’t want to leave. 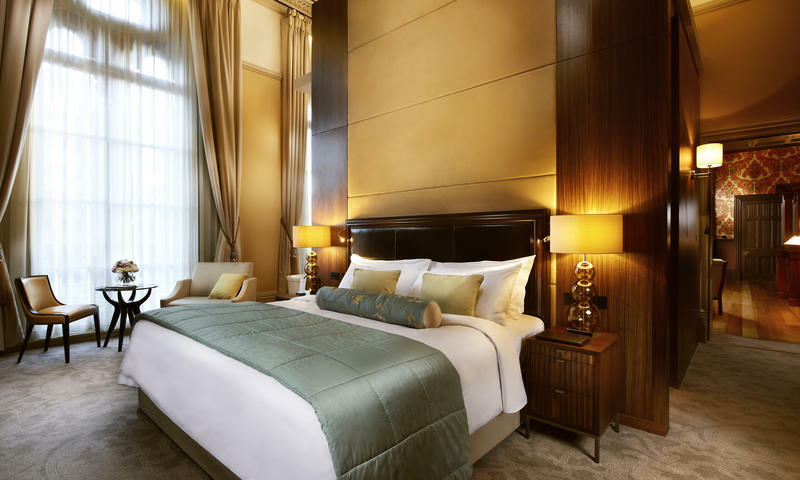 The split-level room had original wooden panelling, 20foot high windows with super thick velvet curtains, so all noise and light from the buzzing main road was eliminated. The mint green eiderdown matched the walls, and a beautiful marble fireplace, with giant starburst mirror made me feel like I was on a film set for Victoria. Although I am not sure what she would have thought of my sartorial choices… No floor length bustles or corsets for me- far too unflattering! However, my glad rags did fit in well in the Chambers Club (a private drinking den, for guest staying in the Chambers wing). Not exactly buzzing, it was more reserved, with lone travellers tapping away on their laptops and couples enjoying a tea and cake, when I checked in to check it out. I took advantage of the complimentary afternoon tea, with wine (natch!) on my arrival, and would have returned for breakfast (served until 10.30) until my guest convinced me to have breakfast in bed. I’m glad we did, as the Room Service breakfast menu was as impressive as the location, and we were still able to place our order when we got in at 1am! 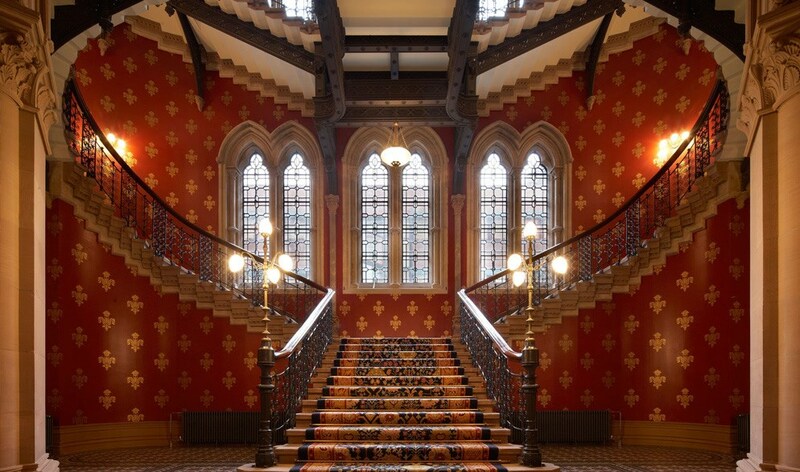 The Chambers Club is a genius idea for visitors. With complimentary light bites light bites served throughout the day, you can enjoy a breakfast buffet from 6:30am-10:30am, afternoon tea from 14:30 -17:00 and pre-dinner canapés from 17:30 to 19:30. Wine and beer is available from 15:00 to 22:00 and soft drinks are complimentary throughout the whole course of the day. This is the place to get re-charged and freshened up, and the expert waiters are happy to help with any requests. If only there were more hours in the day, I would have happily stayed in my princess crib for a while longer, listening to Radio 4 on the Bose radio and perusing the interior decoration magazines. However, the super comfy and exceedingly large bed, did make me lose my bearings in the middle of the night. Climbing back in to, I was overcome with sensory overload and couldn’t quite work out where I was. Nothing to do with several glasses of fashion week champagne of course! Alas, as I was on a fashion mission on this visit, I didn’t venture to the highly-recommended spa (or gym!) Apparently, this is in keeping with the painstakingly restored architecture, and the indoor heated pool, jacuzzi, steam room, sauna and treatments would have been a welcome break if I had had the time. 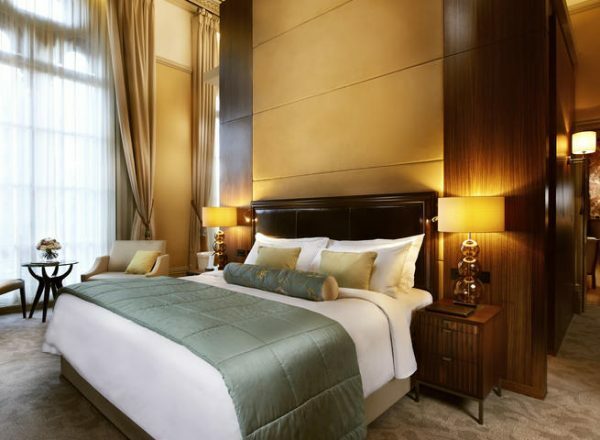 If you are looking for luxury five-star treatment in an enviable location, with personal service and heaps of history. There is only one place to be.